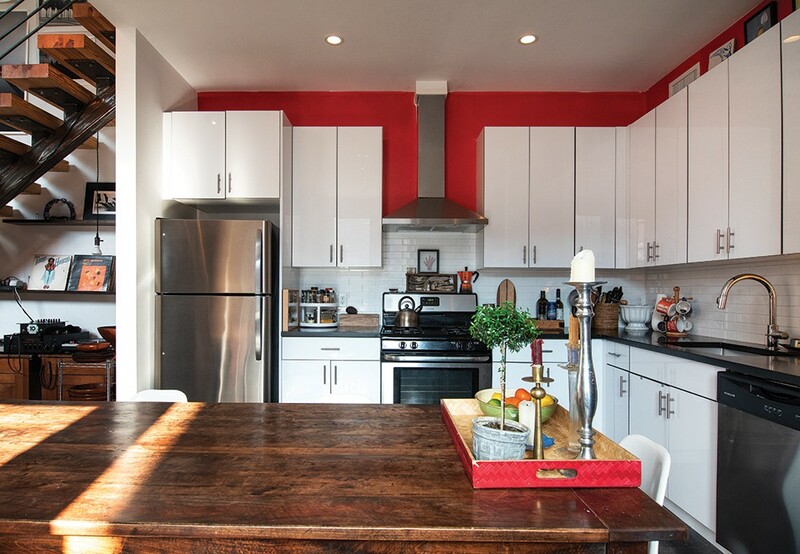 The front end of the loft is dominated by a bright red closet Rice added when she moved in. The striped grey chairs were upholstered with fabric from Sylvester & Co. in Sag Harbor, NY and paired with a cowhide bench made by Amy Pilkington. The marble coffee table in the foyer is from Maison Gerard in New York. First, let's clear something up: Robin Rice never officially attended Pratt Institute. When she was 21, the aspiring photographer moved in with a high school friend, who was actually enrolled at the college, living in an apartment near Pratt's Brooklyn campus. "Everyone thinks I went to Pratt because I used the dark room there, I went and had lunches there, and I printed there. In fact, some of my first pictures were made there," she explains. "But the truth was, back then no one ever asked for ID." The Philadelphia native must have just looked the part. She had gotten her first camera at the age of 11 and had spent the rest of her childhood taking pictures. "It was the best way to express myself," she remembers. "It was easier for me than writing or even speaking." Rice credits those early years not-quite-attending Pratt, surrounded by creative people, for planting the seeds of her long, varied career as a photographer and gallery owner. "I was always taking pictures," she recalls, "but when I moved to New York City I really blossomed." 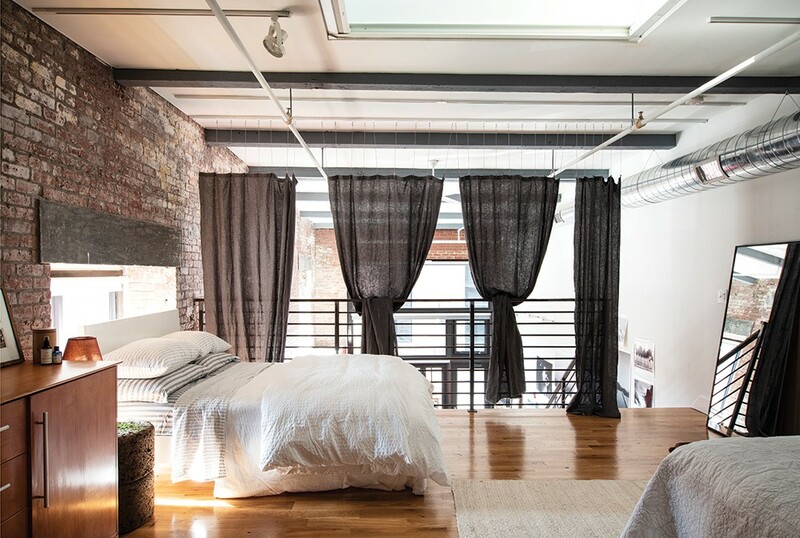 Rice's Beacon loft—one of 200 units recently converted from a 19th-century textile mill along the Fishkill Creek—suits the current chapter of her creative journey perfectly. Since December 2017, when Rice found her way from Manhattan to the Hudson Valley, she's been loving every inch of the open 1,250-square-foot space. It's also close enough to Manhattan's West Village, where she's operated her eponymous gallery for the past 30 years, to commute part of the week. Her Beacon loft is also just far enough away that she can focus on processing her own images. "I moved here mainly for my own work—some days I just scan all day long." She's also found her place in the community of creatives thriving around her. Much like her early days in Brooklyn, Rice has both a place to creatively process and, in the midst of a neighborhood that she estimates is 70 percent artists, the perfect atmosphere of camaraderie. "Because it's an art community, it's so perfect for me to do my work," she explains. Landing in Brooklyn in the mid-1970s, Rice and her camera had an intimate view of a distinctive moment in New York City's history. Shooting mainly in black and white, she developed her particular style of not-quite portraiture by training her lens on the artists, musicians, and iconoclasts around her, in a time of youthful freedom and self-discovery, right before the HIV/AIDS epidemic struck. An admitted "old-school photographer" Rice has been using the same style of small manual Nikon camera since those early days. (She still eschews digital cameras, preferring traditional film.) Instead of relying too heavily on technique or elaborate equipment, she learned to trust the simple chemistry between photographer and subject to create her portraits. "It just happens," she explains. "Maybe I have an idea before, but the actual shooting part happens so organically. It's like I'm not even aware—my camera has a mind of its own." The success of this simple formula is evident throughout her wide-ranging body of work, on display for the first time at her own gallery in her show "It's About Time." 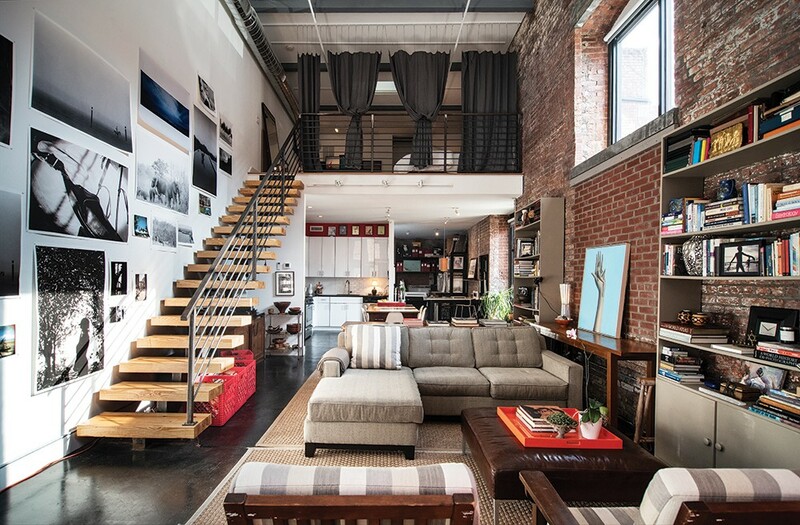 Robin Rice’s loft is one of 200 renovated spaces in The Lofts at Beacon created from a 19th-century textile mill. Right next to the Fishkill Creek’s dam and waterfall, the live/work spaces incorporate many of the original industrial features and enjoy multiple community spaces both indoor and out. Her switch from black and white to color came when she was hired by Discoworld to shoot the opening night of Studio 54. Her close-up photographs were shot on color slides and intimately capture the characters and the mood that made the nightclub infamous. (Rice's Studio 54 pictures are being considered for inclusion in an upcoming retrospective at the Brooklyn Museum of Art.) After developing her artistic eye, Rice worked in commercial photography for 15 years, then found a disheveled storefront on far West 11th street. First intending to utilize it as a studio, she soon realized the space's potential to show work, and opened the Robin Rice Gallery in 1990. Specializing in fine art photography, Rice has developed her aesthetic as a gallerist by understanding both the temperament of artists and the needs of her clientele. "I'm into strong photographs that have lasting power," she says. "I don't like portraits when you think, who is that person? It's more like a feeling. I'm interested in a strong image." In Rice’s studio, she and neighbor Amy Pilkington look over Rice’s pictures of Studio 54’s opening night. A fellow artist, Pilkington also modeled for the print hanging along the back wall entitled “Woman in Chaps” Bridgehampton, NY. The move to Beacon was precipitated by a desire to turn back to her own creative work. 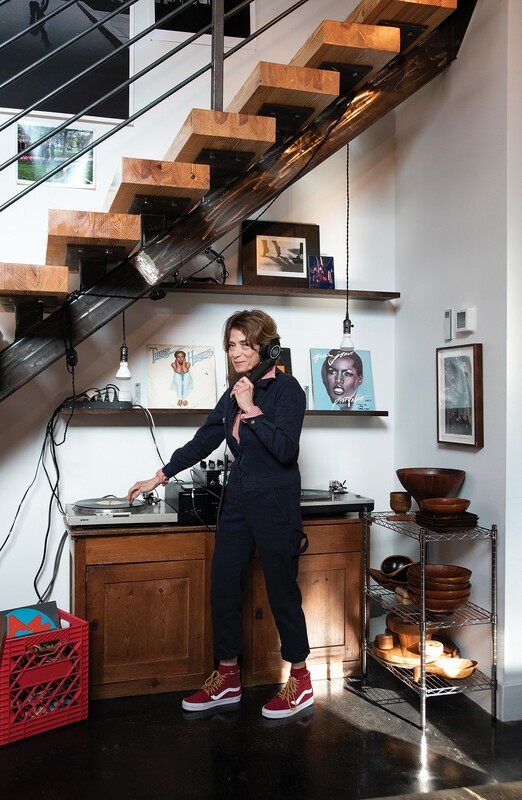 After many years of dividing her time between a small apartment in the West Village and a house in Bridgehampton, Rice was ready to set up a complete work studio in one space. The Hudson Valley called, and she chose Beacon as the perfect jumping off point to explore the region. 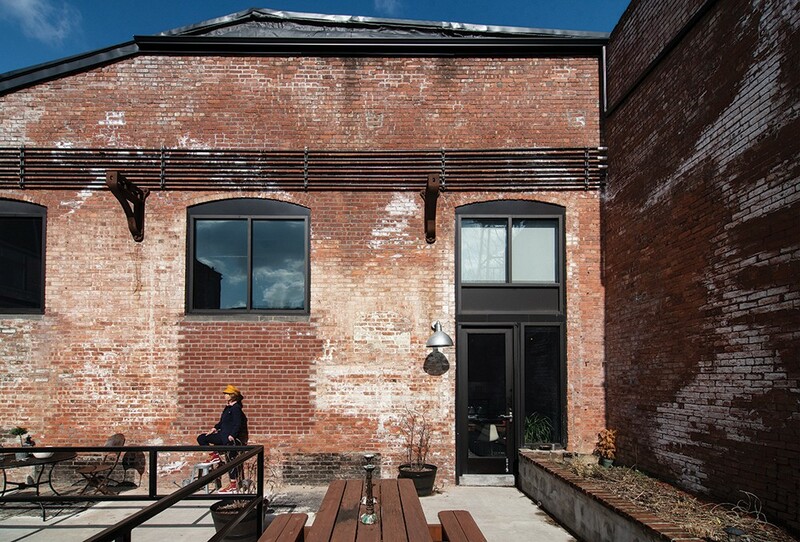 "I loved the art community in Beacon, but mostly I loved the loft itself," she says. Created from the shell of a former carpet mill, the Lofts at Beacon were designed by architect Aryeh Siegal with working artists in mind. (Siegal is also one of Rice's new neighbors.) Updated into a modern vernacular, the home incorporates many of the building's original industrial features. Rice investigated four of the complex's lofts, but came back to the first she'd seen: a corner unit with ample space indoors and out. The 22-foot-high ceilings and open, airy flow of the space seemed huge compared to how she'd been living. "When I first moved in I shouted 'Hello,' and ran from one end of the loft to the other," she remembers. She's since decorated the loft with some of her work, paintings and photographs collected throughout the years, and what she calls a "modern farm-to-table" aesthetic. True to her tendency to create and promote the community around her, she's also bought pieces, or commissioned work, from many of the artisan neighbors in the complex who she now counts as friends. Rice utilizes one of the loft’s 22-foot walls as an ad-hoc gallery space for her work. Along the opposite brick wall she features an extensive collection of art books as well as work collected during multiple travels through Italy. The bright blue oil-on-canvas painting Queen Kong is by Giacomo Piussi and comes from Florence. Franca Sangiovanni’s hand-welded glass lamp is from Salerno. Rice's unit features two walls of original brick punctuated with large windows overlooking the Fishkill Creek to one side, and a common courtyard to another. Black, poured concrete floors stretch throughout the ground level. A wood-and-steel floating staircase stretches along a white painted wall that Rice utilizes as an ad-hoc gallery space to display collages of her own work. 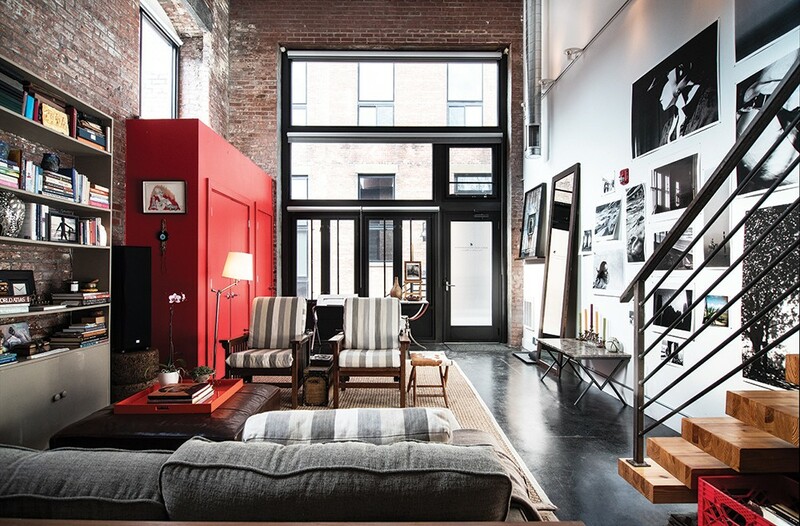 At the loft's entrance Rice added a built-out closet and painted it bright red to contrast the sleek interior design features. Upstairs, the bedroom loft has room enough for two full beds. Rice commissioned Irina Siegal (Aryeh's wife) to make grey linen privacy curtains for the upstairs and bought one-of-a-kind handmade pillows and textiles for the beds from neighbor and artisan Amy Pilkington. Tucked underneath the second-floor loft is an ample work space where Rice has installed a scanner, flat files, a computer and shelving for her work. A full bathroom upstairs and a half-bathroom downstairs are decorated with a collection of Rice's portraits as well as works she's collected over the years. The upstairs sleeping loft features a dresser from the Italian design house Calligaris as well as Pilkington’s handmade textiles. Rice’s framer made her mirrors for the space and architect Aryeh Siegal helped her hang privacy curtains. Rice painted the walls of the open chef's kitchen the same shade of red as the closet. Central to both the kitchen area, and the entire loft, a large farmhouse-style wooden dining table Rice bought in Bridgehampton is matched with modern white chairs. The modern rustic vibe is echoed by the kitchen's quartz countertops and white cabinetry decorated with Rice's collection of Brazilian wood bowls. It's the natural gathering place for guests, and a place where Rice loves to cook. Outside, Rice also has a patio with a raised garden as well as a table and chairs. While she's found the space she's needed to focus on work, Rice has also delighted in the surrounding community she's found. "It's like an adult dorm," she explains. "Here I get to do whatever I want, but people are also really friendly and supportive. It's a perk—the beauty of this community."